I am looking for a future mate for my 3 month old chow from a lovely breeder in NY. Has anyone tried online shipping companies. Are they reputable and trustworthy? Are these type of sites run like mills and if they are mills its probably best to order from them and get the pups out of there as quickly as possible. Please advise. Can you find anywhere on their site that identifies where they are? I couldn't. => We cannot guarantee the disposition or temperament, conformation, size, weight, color, markings or breeding ability of your new puppy. They guarantee nothing! 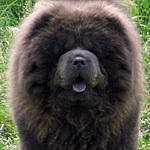 Temperament in Chows is the most important thing in selecting a family pet. "Undecided Testes"...really! The correct term is Undescended.